Bins, tools and methods are on display, so you can learn how each performs. Try them out — there's one that is right for you. During the summer, a Compost Coach is ready to answer your questions, give you a tour, let you try some tools and show you a few tricks. You can even make a mini-worm bin to take home! Teachers can invite the Compost Chef to their classroom for hands-on activities. 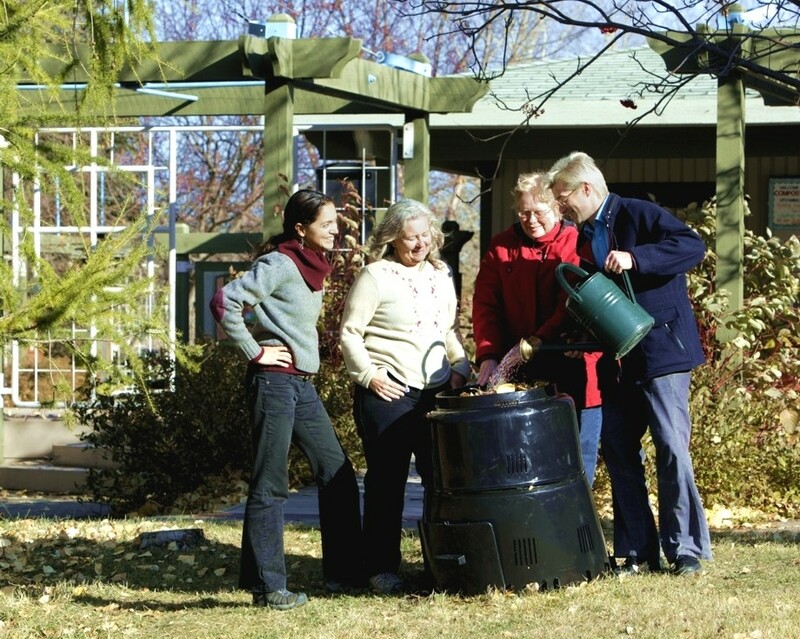 Call 780-496-5404 to book the Garbage In, Compost Out program. To sign up, call 311 or register online. Compost Awareness Week is Sunday May 5 to Saturday May 11! An international event to celebrate what compost does for soil, health, and community. Register on Facebook, or call 780-496-5526. We host workshops throughout the City — call 780-496-5526 to request one for your office or garden club. Compost 'S cool is open and staffed on weekends from Victoria Day through Labour Day. Just learning the basics? We’ve still got our famous Basic Composting Workshop to introduce you to the world of soil and get you started. Rated 5/5. Carbon Farming Workshops – NEW! What turns our silty clay into healthy topsoil? CARBON! Learn the latest science about soil and see how to use simple materials in a way that captures carbon to improve soil. Learn how different weeds contribute to your soil so you can use them instead of fighting them. Sunday June 16 – Bet you didn’t know there’s a day to celebrate Waste Collectors. Come down between 1 and 4 pm to meet a few of Edmonton’s best, make a thank you card to leave out on Trash Day, and take a look at one of our new Automated Collection trucks! Saturday August 31 – Build a worm bin for your classroom. Learn the basics of setting up, maintaining and harvesting a Vermiculture; create a recycling station and a teaching tool. Leave with your bin, resources for the classroom and great advice from fellow teachers. Sign up on EventBrite. Bring your best compost, leaf mould, castings, or soil. We’ll mix our materials to create a microbe- and nutrient-rich blend, and then you’ll take home as much as you brought. Use it to inoculate your compost pile or garden. Healthy soil is full of tiny living things that help plants grow. Damaged soil can lack many beneficial organisms. This event is about sharing the life in our soil and helping each other grow. By sharing microbes we increase biodiversity and help heal chemical damage caused by our misunderstanding of soil over many decades. Saturday November 2 – Last year 300 kids smashed over 500 pumpkins. You know you want to be part of that! Watch for details about this event on Facebook@CompostScool. Host a free 45 minute presentation and watch your business "go green" with the help of our waste reduction specialists. Compost like a pro with simple tips from the City's Compost Doctors. They'll help you understand the process so you can easily create a product that will help you reach your gardening goals. "Carbon Farming” is a horticultural solution to the Greenhouse effect. If just one percent of humans became carbon farmers all the CO2 emissions produced in a year would be drawn down into the soil. Learn how you can make a few simple changes in your house and garden to start farming carbon this spring. Turn Clay into Soil! Learn the natural processes involved in Soil Building so you can improve your weedy, compacted, poorly growing garden. Healthy plants grow best where soil building techniques improve depth, tilth and aeration. Host a soil building workshop for your social club or Community Garden. Free to not-for-profit groups in the Edmonton region. The deck is being repaired in a few places, but we're open during construction. Cost: It's free to drop in. Hours: 10am-4pm, weekends and holidays, Victoria Day to Labour Day. Location: Between the John Janzen Nature Centre and Fort Edmonton. Find us on Google Maps.